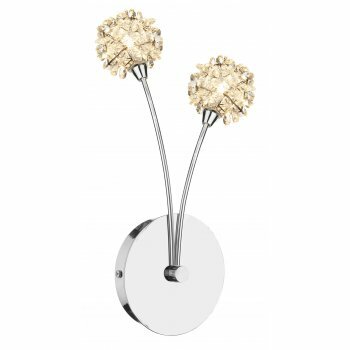 Dar Lighting Alonso 2 light halogen wall fitting features a polished chrome circular wall plate with 2 polished chrome stems leading to spherical heads of small crystals. The product code for this Dar wall fitting is ALO0950. This stylish wall fitting will sit well in both modern or contemporary decors within your home. The all new Alonso collection also includes a table lamp, a semi-flush ceiling fitting and a ceiling pendant.